From complaints about the goal horn to the uneasiness of the transition to the Barclays Center, Islanders fans have had quite a lot to talk about over the last month. Attempting to carry over tradition from Nassau to Kings County (condensing of divisional banners, among other things) hasn’t gone as seamlessly as some fans or executives may have envisioned, but the product on the ice has largely done the talking for Brooklyn’s new sports team. With nine different players having scored goals through the Isles’ first four games of the ’15-’16 regular season, the burden of scoring hasn’t fallen squarely on John Tavares’ shoulders – but nobody is complaining about the forward’s six points (3G, 3A) and two game-winning goals during the early stages of this year’s campaign. Receiving contributions from various skaters in the lineup has helped the Isles to a 2-1-1 start in the Metropolitan Division, but perhaps the biggest difference-maker for New York has been the man between the pipes. Signed on the first day of free agency by Garth Snow, Thomas Greiss has made quite the impact on the Islanders as Jaroslav Halak recovers from an upper-body injury, but one has to backtrack several years just to understand the scope of Greiss’ recent contributions. Over the last several years, Islanders fans have been accustomed to seeing backup goalies come and go with regularity. Whether it was Al Montoya, Kevin Poulin, Anders Nilsson, Chad Johnson, or Michal Neuvirth, New York rarely seemed to have a number two that would play with consistency when his number was called on. Sprinkle in a little bit of Rick DiPietro, Nathan Lawson, and Mikko Koskinen, and one could see just how much of a logjam the Islanders have had in net since the ’10-’11 hockey season. Of course, some of the goalies mentioned above didn’t get to play in front of the best on-ice product – or were never given consistent playing time to begin with – the simple fact of the matter was that the Isles struggled to get formidable production out of their backups. On the one hand, Al Montoya and Kevin Poulin showed some promise during the ’10-’11 NHL season when Jack Capuano took over as the Isles’ bench boss, but neither of the aforementioned goalies were able to replicate the success that they had in their first season on Long Island. Riding the likes of Evgeni Nabokov (41 games played out of 48 total contests) and Halak (59 games played out of 82 total contests) to playoff berths in 2013 and 2015, it was plain to see that New York was heavily reliant on their number-one goalie to help them toward their respective playoff pushes. While the Islanders challenged the Pittsburgh Penguins and Washington Capitals in their past two playoff appearances, there are few that can deny the fact that some extra rest for the Isles’ primary goaltenders during these separate seasons could have gone a long way for the team’s fortunes. Sure, having a dominant starting netminder that gives their team the best chance to win on a nightly basis is something that no NHL team – or its fan-base – would refuse, but having a reliable insurance policy in case of overworking or injury could be just as important. Maybe Halak’s injury was a blessing in disguise for the New York Islanders – and no, this is not being posited in a cynical or sarcastic manner. Looking at New York’s last two seasons that have resulted in a playoff berth, one could see – as previously mentioned – that the Islanders’ starting goalies were asked to play a significant portion of the regular season schedule, which would naturally lead to a trickle-down effect of sorts for the team’s backup goalies. 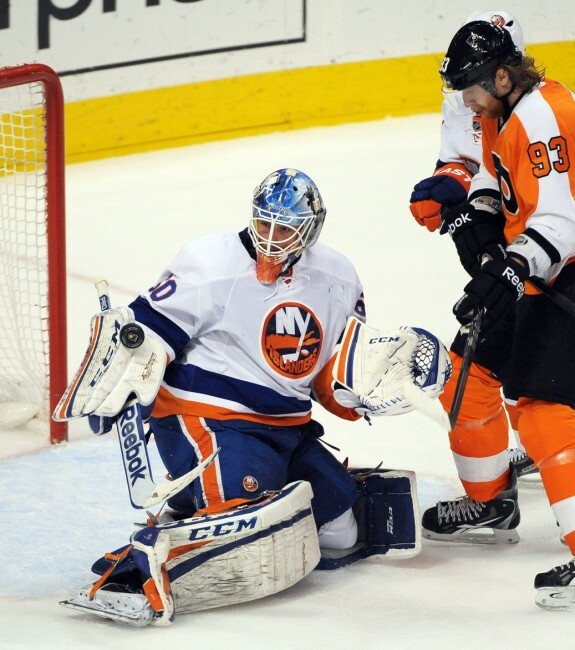 When Nabokov played in 41 games during a lockout-shortened ’12-’13 season, many viewed the heavy workload on the veteran netminder as a necessary evil in order to secure a spot in the postseason. Flash forward to last season and one could spot the same trends with Halak as the goalie logged a significant amount of playing time en route to the number five seed in the Eastern Conference playoff race. However, despite making it to the playoffs, the workload that Nabokov and Halak played through opened the door for other easily-discernible observations. Key among those observations was the fact that the Isles’ backup goalies were never given adequate playing time that would allow them to settle into any type of groove. During the ’12-’13 hockey season, Kevin Poulin wasn’t given a chance to see consistent playing time, but that scenario was unique because of the shortened season and New York’s desire to secure a playoff spot by taking any, and every, advantage afforded to them. Last season, Chad Johnson and Michal Neuvirth combined to play in 24 games for the Islanders, but neither goalie was given much of an opportunity to establish their game – save for the nine-game stretch that Johnson saw at the beginning of the ’14-’15 season. Neuvirth also played in five games over a span of three weeks in March, but his inability to spell Halak in a formidable-enough manner (sub-.900 SV% in four of six appearances) undoubtedly forced New York’s hand during the latter portion of the ’14-’15 season. While being without Halak for the early stages of this season probably worried fans to no end, Thomas Greiss has done quite a lot to assuage Islanders fans – and not just for the short term. Playing in three games thus far for the Islanders, Greiss has gone 2-0-1 and has put up some very respectable peripherals (.925 SV% & 2.64 GAA) while helping New York gain points against tough competition such as the Blackhawks, Jets, and Predators. Recently out-dueling Pekka Rinne, Greiss has looked more comfortable in each game that he has played in the Isles’ crease. Most importantly, Greiss’ growing comfortability and consistency has instilled confidence in New York’s coaches and upper management – something that has allowed Halak to recover without being rushed to return, and has given Islanders fans hope that they finally have a backup goalie that could be counted on at a minute’s notice. Despite the fact that Greiss has filled in seamlessly through his first three games played, there will be individuals that remain unconvinced as to the goalie’s abilities over the stretch of a full NHL-season. Once Halak is ready to return to action for New York, Islanders fans can certainly expect to see their number one goalie between the pipes for the lion’s share of the remaining games on the regular season schedule, but they should also expect to see a lot more of Greiss as well. As a member of the San Jose Sharks, Greiss’ peripheral totals (.912 – .915 SV%/2.30 – 2.69 GAA) remained fairly constant, and the team was able to start their backup with ease whenever Evgeni Nabokov or Antti Niemi needed some rest. 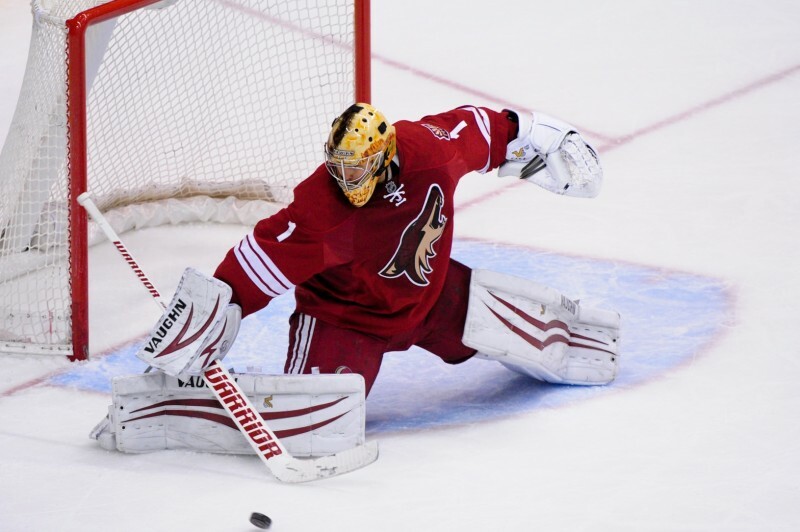 Playing as a member of the Phoenix Coyotes, Greiss was able to put forth his most solid season (25 GP, .920 SV%, & 2.29 GAA) while under the tutelage of the goalie whisperer, Sean Burke. Yes, Greiss did see a decline in his peripherals as a member of the Pittsburgh Penguins, but then again the goalie found it hard to receive constant playing time with Marc-Andre Fleury firmly entrenched as Pittsburgh’s starter. While Halak will be New York’s go-to goalie when he is healthy enough to return, Greiss has already done a considerable amount of work through the Isles’ first several games to establish himself as a legitimate backup on a team with some high expectations in a new home.